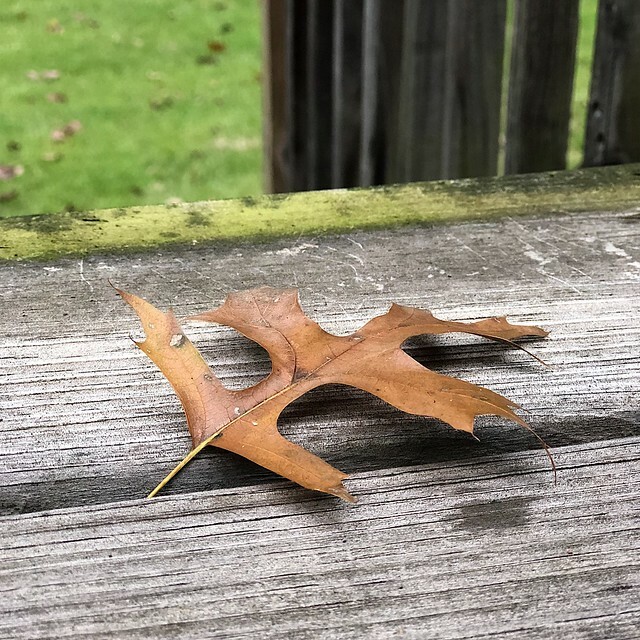 Many act like Labor Day weekend is the end of the summer, and in a lot of ways it is. But the weather has reminded me that we still have a few weeks yet of summer. We’re in those last weeks, the sultry, steamy days of late summer, when the air hangs heavily, even in the morning before the sun has risen. Waking before dawn, I can feel the air of my bedroom hanging expectantly, waiting for the air conditioner to cycle on. It’s dark, but already I can see the haziness outside. Stepping out of the house, into the darkness, already the air hits me, a wall of heat and humidity, beckoning me out into the sweaty commute that lies ahead, and urging me back into the house, back into the artificially-cooled oasis I’ve made. 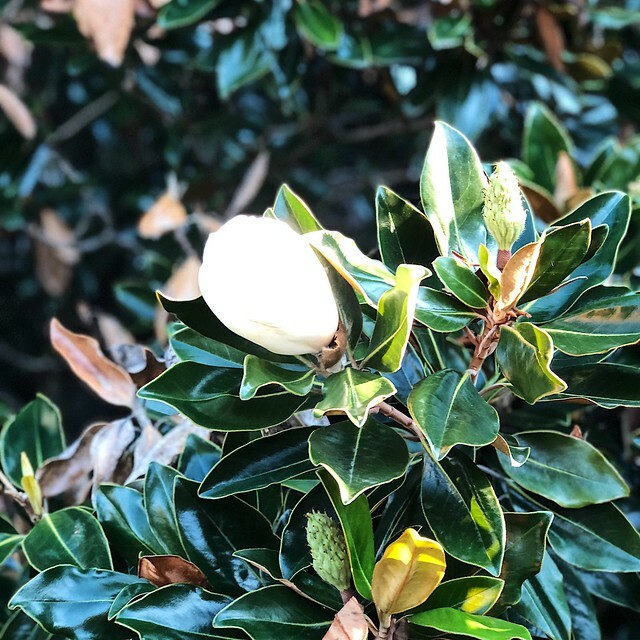 Walking to work, I saw a magnolia tree laden with new buds, getting ready to bloom again, as if reminding me that summer has not truly passed this year. While it might not be the scorching one hundred degree days, the air still feels heavy and hot, weighting down clothes, hair, and spirits. My blouse clings to my chest and belly where the sweat has already started to glisten, coalesce, and bead on my skin, rolling down in streaks as I make my way through the morning heat. Eventually, I feel saturated with humidity, and it no longer matters how long I’m out. As the walk goes on, I can feel my body grow used to the heat, letting the sweat cool it off as I go. I feel the stark boundaries between the extra heat from the cars and the cool blasts of air from the briefly-opened doors of businesses as I make my way through a city on the verge of autumn, but not quite there. Eventually, I will smell wood smoke, cooler air, and dry leaves, but this morning, I smell the smells of the city, hanging in the humid air, unable to rise under the weight of the heat and haze. But it’s warm and familiar, and ready to dissipate, I hope. Arriving at my office, I brace myself for the blast of icy air, feeling the sweat on my body chill, a shiver escaping for a moment, before I adjust to this, too. And when I get to my office and feel my body cool and the sweat dry, I put on a sweater against the chill of the air conditioning, looking forward to the promise of cool mornings and temperate days. I’ve posted some images recently on my Instagram of my experiments in cold-brewing tea, and I’ve even teased on my YouTube channel that I would do a cold tea video sometime. But I’ve decided that to really do justice to my cold-brew adventures, I needed to devote a blog post to it. 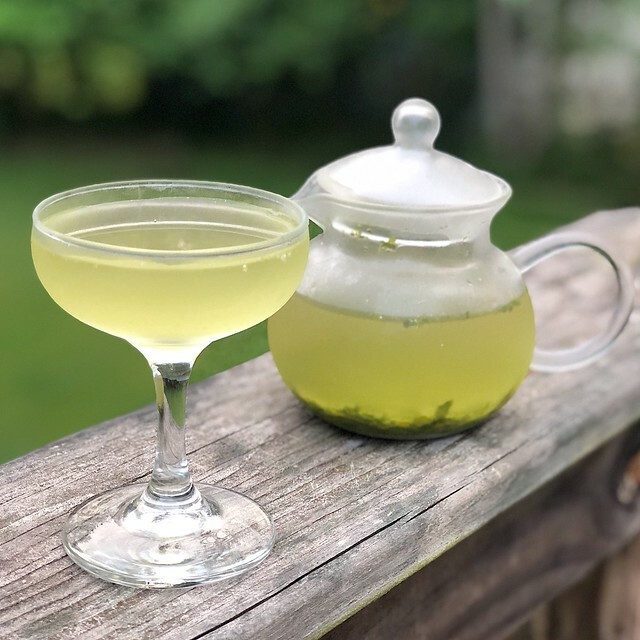 And stay tuned to the end, when I share a little recipe for one of my favorite summer iced tea drinks! At its heart, cold-brewing tea is incredibly simple. You just put some tea leaves into some cold water, stick it in the fridge, and wait. 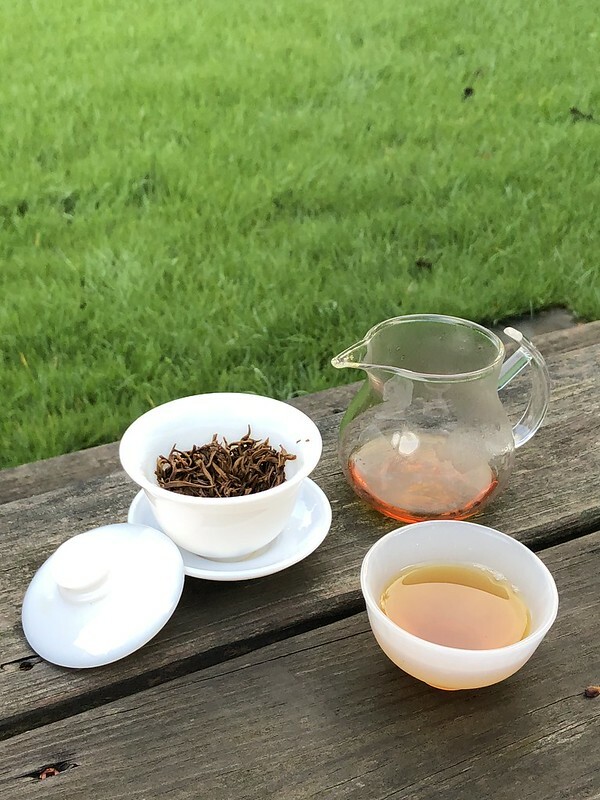 I used this article from Serious Eats as my guide, specifically the author’s recommendation of about 10-12g of tea per quart of water. I tend to brew a pint of tea at a time, so that’s about 5-6g of tea per brewing. Then I decided to go a little nuts and try brewing in sparkling water. I got some good-quality 500-ml bottles of sparkling mineral water from the store and experimented with green, black, and oolong teas. I haven’t tried white tea yet, but I imagine it would be pretty nice. Here’s what I’ve found so far. 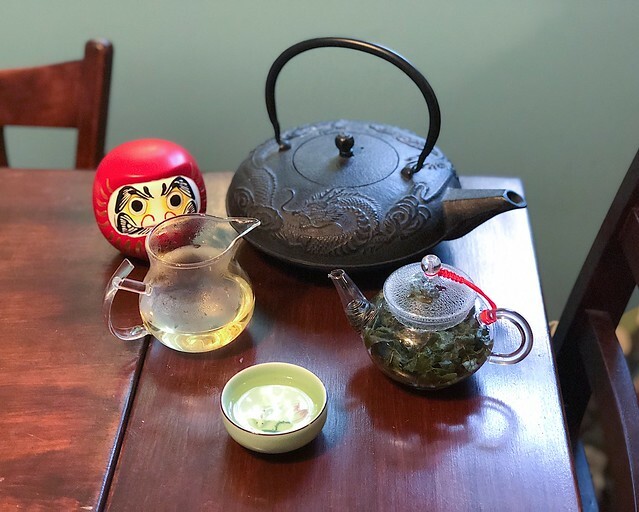 I started out with Rishi Sencha as my first experiment. I’d heard a lot about brewing Japanese green teas cold, and I thought it would be a good place to start. 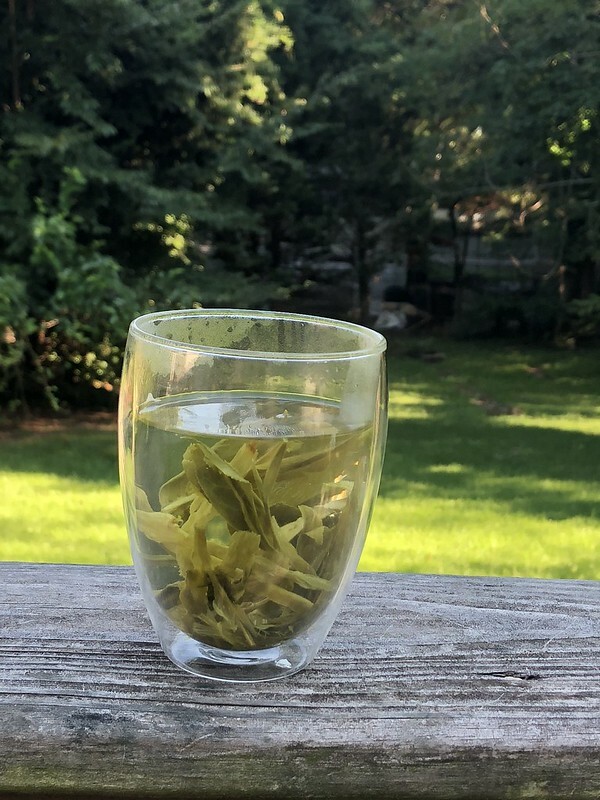 The Rishi sencha is a decent sencha, with a nicely balanced flavor profile of grassy and umami, but it’s also available in my local grocery store and not so expensive or difficult to get that I would worry about “wasting” it on an experiment. So I started there. Cold-brewed, this sencha retains a lot of it’s interesting umami flavor, with a nice green undertone. It doesn’t have any bitterness or even really astringency, apart from a mild tartness that is quite pleasant. It’s very refreshing. It also shines in sparkling mineral water, as the minerality of the water offsets the umami. I could also see using this as the base in a gin-based tea cocktail, if I liked gin (or were indulging in hard liquor at the moment). 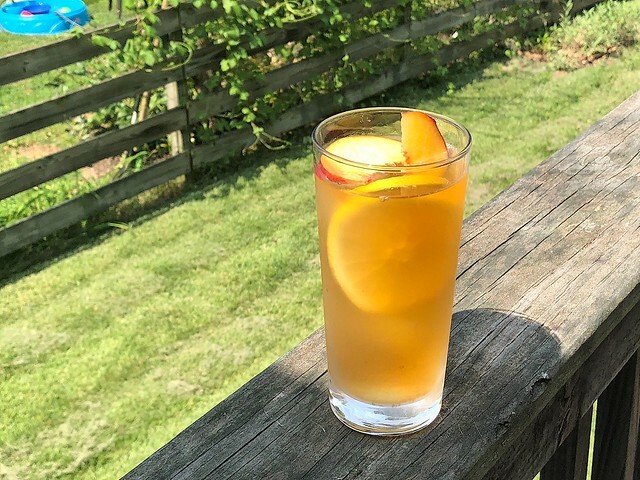 I will admit, I only tried cold-brewing black tea because my husband made a nostalgic comment about Wawa peach iced tea and I wanted to see if I could make something better using cold-brew and homemade peach syrup (spoiler: I did; read on for the recipe at the end of this post). So I grabbed an old tin of Harney & Sons Darjeeling that my mother brought over for a tea party at my house. I chose the Darjeeling for two reasons. The first was the aforementioned rationale about not using teas I would miss if the experiment failed, and the other was that the Serious Eats article doesn’t seem to recommend cold-brewing black teas because their flavor profile is muted, so I thought if I went for a lighter black tea, rather than a big, punchy Assam, it might work better with the cold-brew method. I was right about the tea. Despite the fact that I only brewed this to be sweetened, I tried a taste of it before adding sweetener and it’s fantastic. The infusion is a deceptively light color, but it has a lot of black tea flavor, without any dry-your-mouth-out tannins or unpleasant bitterness. It tastes like perfectly-steeped black tea. And it stands up quite well to the peach syrup, too. I also enjoyed it in sparkling water. 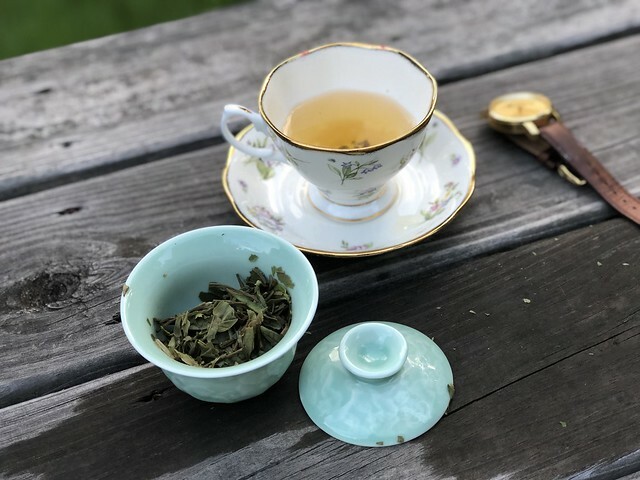 Oolong is my favorite tea and one that seems well-suited to cold-brew, as it has a lot of complex flavors that seem like they would work well in a refreshing cold beverage. 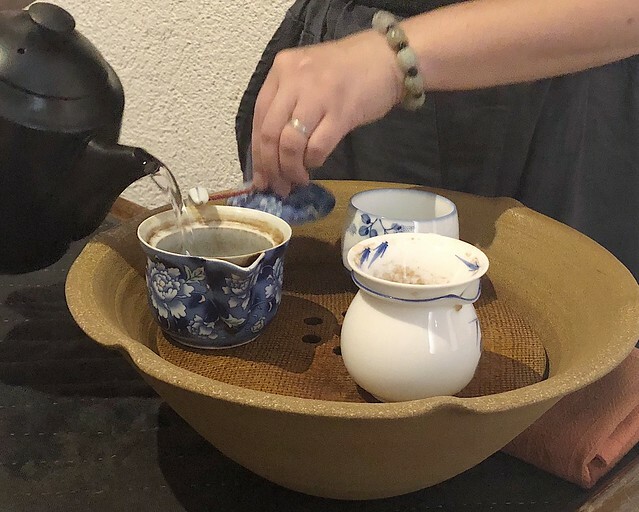 I only tried oolongs steeped in sparkling mineral water, though their charms would almost certainly translate to still water. 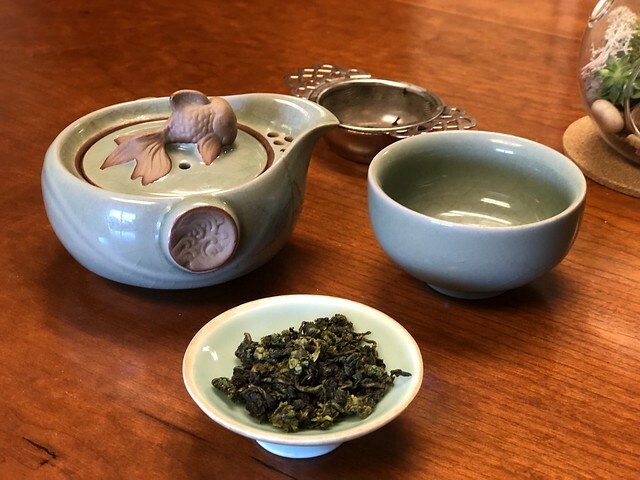 The first one I tried was a Golden Lily oolong that is a “milk oolong” variety. I idly thought to make a sort of oolong cream soda. It worked well enough, but the green-ness of the tea made for a rather light cold-brew infusion. But, wow, my next experiment did not disappoint. I found some old heavy-roast Tieguanyin in the back of my tea cabinet and thought, hey, why not chuck it in some fizzy water? I had thought to try it with my peach syrup. Well, the resulting brew was so lovely and complex — with notes of peaches, honey, flowers, and cream already — that I didn’t dare touch it with sweetener. This is my favorite yet and will likely become a new regular in my daily tea rotation. The absolute only thing I would ever add to it would be a shot of bourbon. As promised, I’ve also come up with a recipe for peach iced tea using cold-brew. The first step is to steep 5g of Darjeeling tea in 16 oz. of water. Then, you’ll need to make the peach syrup by roughly chopping one fresh peach and putting it in a small saucepan with 1/2 cup of water. Let this simmer until the peach is soft enough to be mashed with a fork, about 15-20 minutes. Then, stir in 1/2 cup of granulated sugar and simmer until all the sugar crystals have dissolved. Strain the syrup into a jar and let cool. To put together the drink, strain the tea leaves out of the tea, and add about 2 Tbsp. of peach syrup (or to taste) to the tea. Stir well and serve over ice with a slice of lemon and a couple slices of fresh peach. Makes two glasses of iced tea. My husband’s review was that “it’s pretty good.” So there’s that. Happy steeping! Anyone who watched my Instagram Stories while I was on vacation in Barcelona might have noticed the meal at Bodega 1900, where I waxed rhapsodic about pretty much all of the food. But I think my favorite part of that meal was the part that I could actually kind of take home with me: their tomato salad. Now, their tomato salad were special, locally-grown tomatoes that were served with their house-made feta cheese. But the most striking thing about them was their simplicity. The tomatoes were simply peeled, cut into chunks, and served with a pinch of salt and pepper and a drizzle of olive oil. The thing about this recipe is that it’s not really a recipe. It’s all about the individual ingredients. It’s pretty common culinary wisdom that the fewer ingredients a recipe has, the more important it is to get the best of those ingredients. 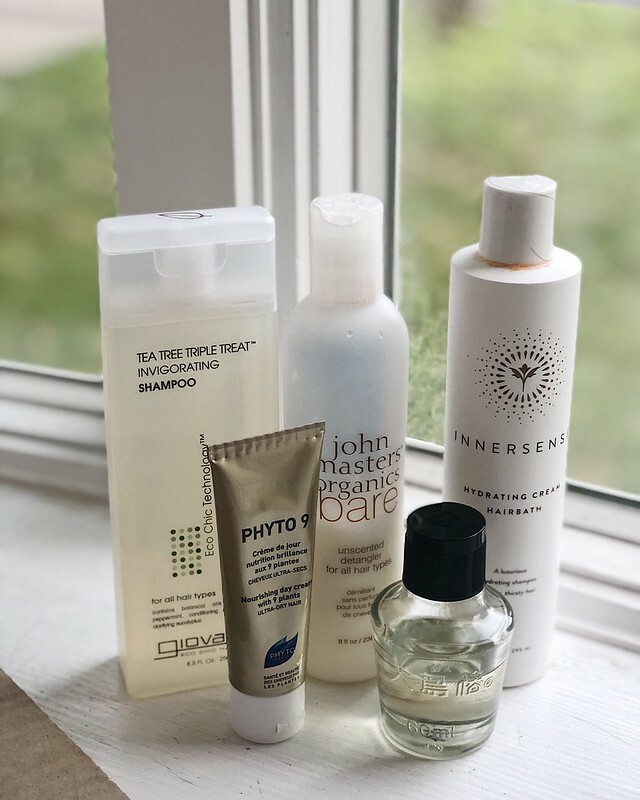 Now, I only use freshly-ground peppercorns and mineral-rich sea salt in my kitchen, so those are pantry staples for me. But if you don’t, this is where you’re going to want to break out that fancy box of flaky sea salt your mom gave you for Christmas when fancy sea salts were the in gift (just me? okay). And get the best olive oil you can find. Again, I have a great local grocery store that recently put in a bulk olive oil bar, so I can get very fresh olive oil every couple of weeks for a very reasonable price, so that’s what I use. 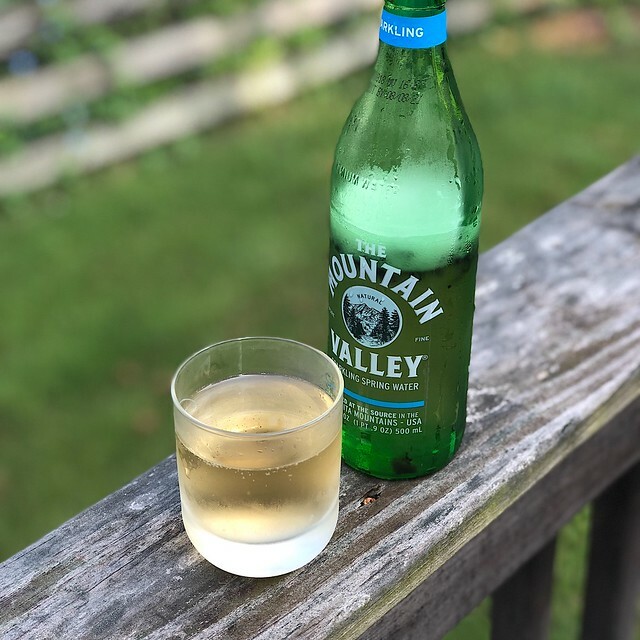 It’s a Napa Valley olive oil with a fresh, buttery flavor and none of the acidic bite that can indicate the olive is starting to turn. And then there is the tomato. I have made this salad with Roma tomatoes, standard slicing tomatoes, and a few heirloom varieties, and I have to say, I vastly prefer the heirloom varieties. I will say that, despite the giant honking tomato in the picture above, it does best with a medium-sized tomato. Basically, you want to be able to cut the tomato into pointed chunks. 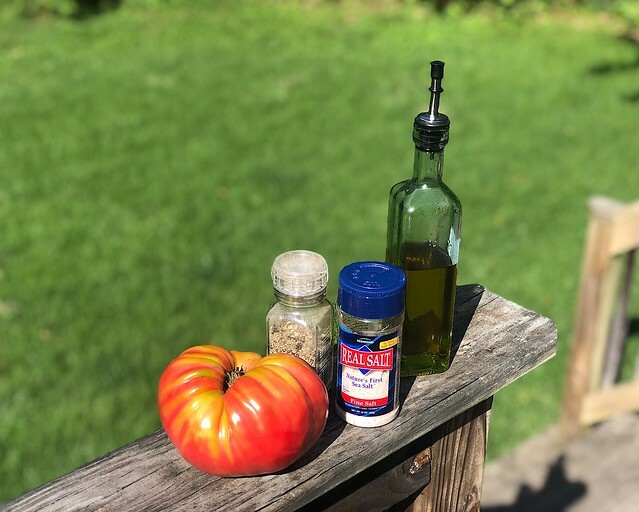 If I use an heirloom tomato, I will usually skip peeling it, as the skins are so thin, but a regular slicing or Roma tomato will get a little X cut in the non-stem end, a quick dip in boiling water, and a quick peel. It’s not as fussy as it sounds, I promise. Then, you dress it simply, right before serving, and marvel at the masterpiece. Wash your tomatoes (and peel, if desired). Remove the stem and white core around the stem, and cut into 6-8 wedges. Cut each wedge into 2-4 chunks. Arrange, skin side down, on a large flat plate or bowl, in a single layer. Sprinkle with salt and pepper and drizzle with olive oil. Consume immediately. Serves 2-3 people. It’s been a while since I’ve talked about media and entertainment, but I’ve started listening to more podcasts while I commute again. Since I’ve exhausted most of my backlog of old episodes of Myths and Legends, I had to find some new podcasts with large archives to work through. So I thought I’d share two that I’ve been enjoying recently. 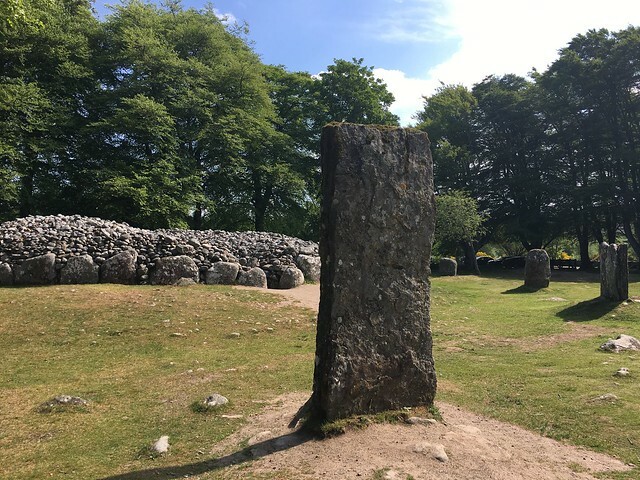 As longtime readers of my blog know, I’m a bit of an anglophile, and since getting back from our trip to Scotland, I’ve had even more of an interest in the history of Britain. So I downloaded The British History Podcast on a whim, and I have to say, I was blown away by how entertaining it is. The host, Jamie, has a similar style to Myths and Legends’ Jason, infusing the stories from history with humor and balancing modern commentary with taking into account historical context. I do think that my favorite thing about the BHP is that Jamie does make a sincere effort to focus not just on the “great men” model of history that is so common, but does shows on other aspects of the history of Britain, including a really fascinating series on Anglo-Saxon period medicine, food, and clothing. He also got a fantastic series of interviews with researchers who were studying the Staffordshire hoard. As someone with an interest in folklore, mythology, and legend, I particularly enjoy how the history of the island has helped frame my understanding of the stories I know from Britain. I also found the Romano-British period surprisingly fascinating. Despite starting my college life as a classics major, I focused more on Greek classicism than Roman, and never really delved into the intrigue that is Roman history. I might actually check out a Roman history podcast to fill in the non-Britannia-related gaps in the stories I heard on the BHP. Another podcast I’ve been enjoying is the Folklore Podcast. Hosted by Mark Norman of the Folklore Society, this is a different style of podcast from the BHP. It’s a bit drier in tone and style, and more educational, though it is obviously entertaining enough to hold my interest for several episodes. Norman focuses on the connections and context of various aspects of folklore, revolving around a common theme within each episode. Rather than telling a single story or a set of stories, the way Myths and Legends does, Norman spends most of his time discussing the folklore and tales. He also brings in some great guests for the show so that people can offer a scholarly perspective in their own specialties of study, rather than focusing exclusively on the host’s knowledge and special focus. It’s particularly interesting to hear the same stories told by the Folklore Podcast and Myths and Legends, just as it was interesting to hear the BHP cover King Arthur. One caveat: The production quality of the Folklore Podcast is not as refined as other podcasts I listen to, and I find myself having to adjust the volume up and down during a single episode, especially when there is a guest speaker who’s volume is much higher or lower than the host’s. But it is a minor annoyance at worst and doesn’t detract from my enjoyment of the content. So those are two podcasts I’ve really been enjoying. They’re similar in content, though very different in style, and they’ve served me well on my commutes and some long plane rides lately.